Proprietary Name: Ibuprofen Minis What is the Proprietary Name? 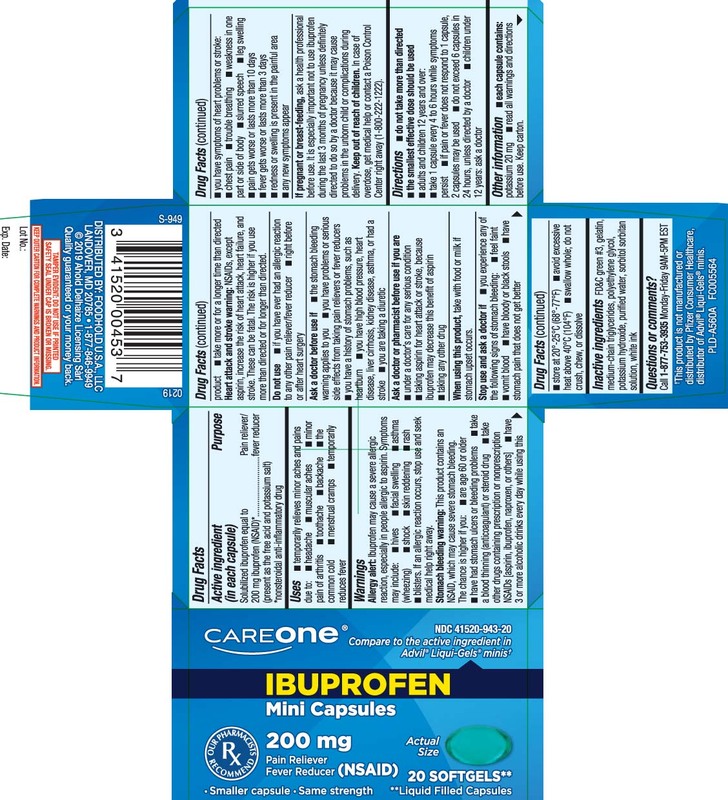 Ibuprofen Minis with NDC 41520-943 is a a human over the counter drug product labeled by Care One (american Sales Company). The generic name of Ibuprofen Minis is ibuprofen. The product's dosage form is capsule, liquid filled and is administered via oral form. FDA Application Number: ANDA206568 What is the FDA Application Number? Allergy alert: Ibuprofen may cause a severe allergic reaction, especially in people allergic to aspirin. Symptoms may include:hives facial swelling asthma (wheezing) shock skin reddening rash blistersIf an allergic reaction occurs, stop use and seek medical help right away.Stomach bleeding warning: This product contains an NSAID, which may cause severe stomach bleeding. The chance is higher if you:are age 60 or older have had stomach ulcers or bleeding problems take a blood thinning (anticoagulant) or steroid drug take other drugs containing prescription or nonprescription NSAIDs [aspirin, ibuprofen, naproxen, or others] have 3 or more alcoholic drinks every day while using this product take more or for a longer time than directedHeart attack and stroke warning: NSAIDs, except aspirin, increase the risk of heart attack, heart failure, and stroke.These can be fatal. The risk is higher if you use more than directed or for longer than directed.